How Did People Like Us End Up in a Luxury Lodge? Years ago, I was photographing hippos near a waterhole when a leopard dashed out of the bush and snatched a crocodile from the water (see video clip). It was only my fourth day in Kruger and I had already witnessed something that nobody had ever documented in all of human history. I would be forever hooked on Kruger National Park in South Africa. Kruger is one of the premier wildlife-watching destinations on the planet. Leopard attacking crocodile in Kruger. 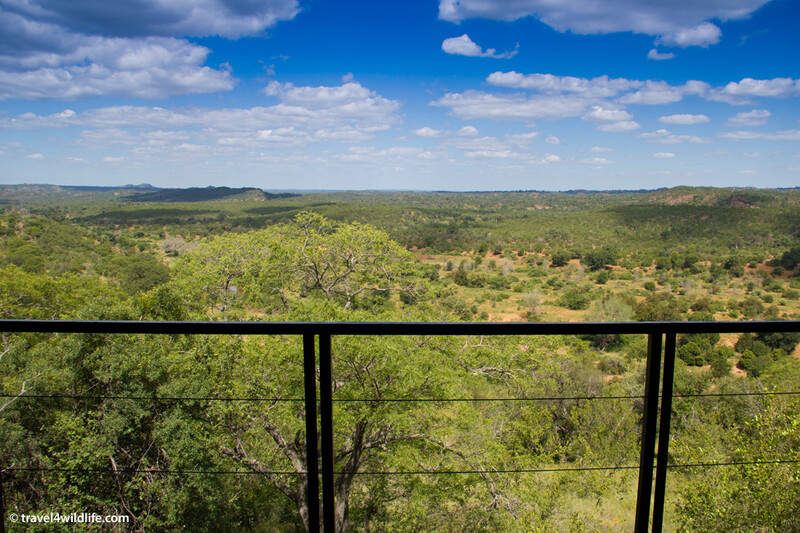 There’s no denying that Kruger is one of the premier wildlife-watching destinations on the planet. The diversity of large mammal species is astounding and the size of the park is staggering. Yet, even in a place so spacious, the crowds of human spectators can occasionally become overwhelming, especially in the easily-accessed southern end of the park. 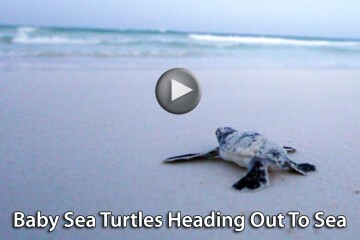 That’s why Cristina and I were really looking forward to making the long journey to the northern tip. Our opportunity came when I entered a competition in South Africa’s Getaway Magazine, calling for essays of amazing Kruger encounters to be used in an upcoming book entitled Kruger Tales. 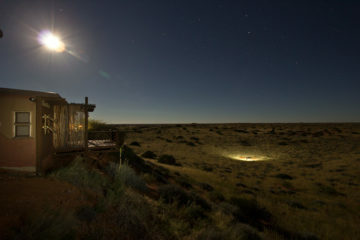 My leopard vs. crocodile story took first place, and the prize was a two-night stay for two people in a luxury resort in north Kruger: The Outpost Lodge. This was the excuse we needed to plan our next trip to Africa and Kruger became our first destination. A few months later, we flew to Johannesburg, rented a car, and drove five hours to the park. After seven nights of camping and slowly making our way from south to north, we arrived at the top of a long gravel drive through the wilderness and found ourselves in the lap of luxury. I must admit, I felt like a bit of an impostor pulling up to The Outpost. We had never stayed in a luxury lodge and, after a week of camping, must have looked like a couple of ragged homeless folks who had snuck in through a hole in the back wall. But we were warmly greeted by three smiling employees including the manager. She led us to the bar where our jaws instantly dropped upon seeing the amazing view. 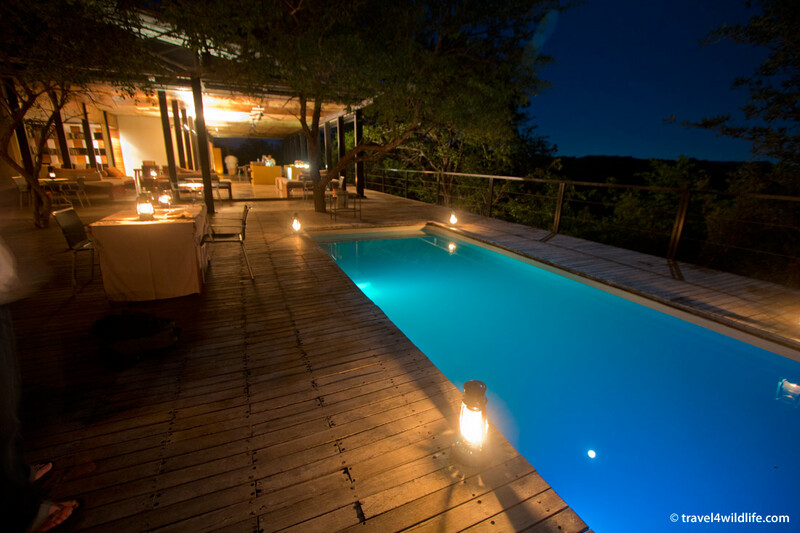 The Outpost is perched on the edge of a cliff overlooking the Luvuvhu River. From up here, the rolling African sandveld sprinkled with baobabs and acacia trees appears to stretch to the ends of the earth. Once we had tucked our chins back in we were handed an iced tea in a cocktail glass. I could get used to this. The entire common area is open to the air on three sides, providing stunning views and cooling breezes. The roof, high above, covers a dining area with elegant tables, a modest but modern bar, and a comfortable sitting area populated with cozy chairs and a fireplace. To the right, backed by attractive stone walls, stretches a huge multi-level sun deck housing a clear blue swimming pool and outdoor lounging beds scattered amongst artfully spaced acacia trees. The beautifully designed pool, sitting area, bar, and dining area at the Outpost. After a quick tour of the common area, the manager led us down a long boardwalk that seemed to disappear into the wilderness. We soon realized this was the path to the “rooms”. Each one is a separate building raised on stilts overlooking the valley. 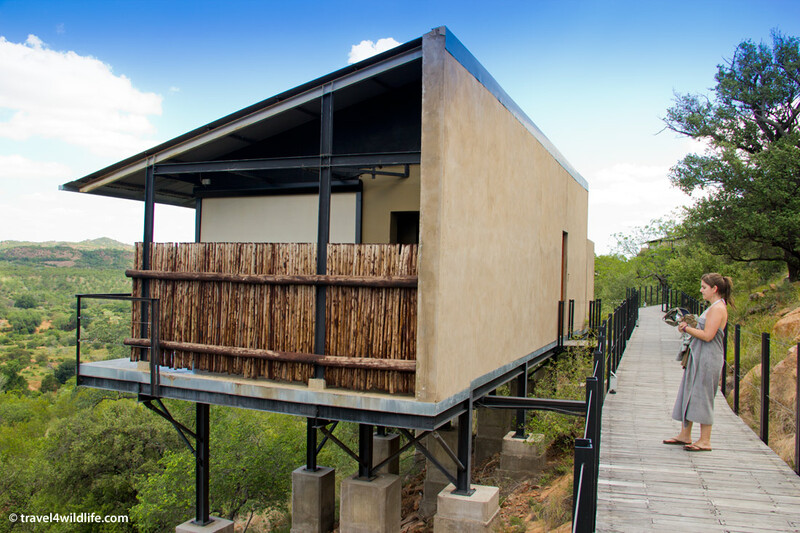 Each room at The Outpost is a separate unit on stilts overlooking the river. But what truly makes the Outpost such an incredible place to stay is the design of these units. They are completely open on three sides. 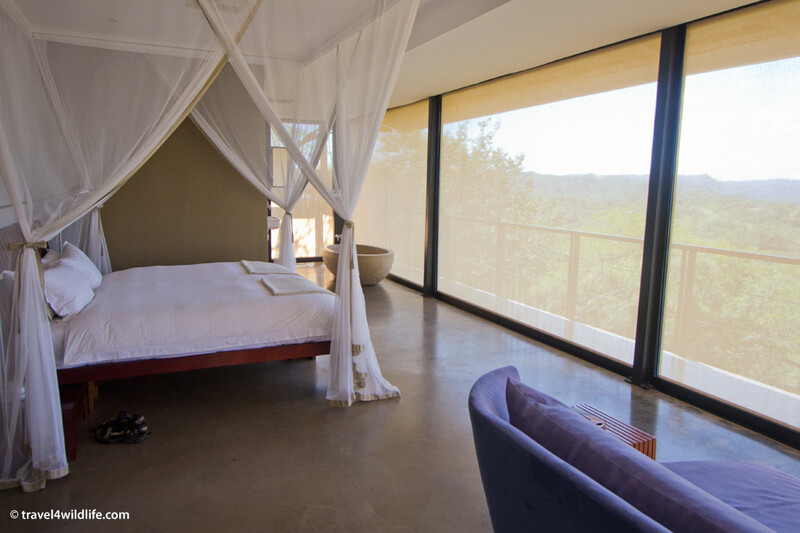 You can lie in bed and watch an unobstructed panoramic view of the sun rising over the valley. And more amazing still, you can take a bath in the tub which is perched at the edge of the railing, watching the elephants and buffalo strolling by in the plains below. I can confidently rate The Outpost as my number one favorite bathtub in the world. For those moments when you feel like you need a little more privacy, or want to keep the mosquitoes out, you can close the electric blinds with a remote control, which is pretty darn cool. The interior of our room with the electric blinds closed. Breakfast, lunch and dinner are included in your stay, mainly because there is nowhere else to eat within a hundred miles. You’ll be very glad about that, because the food here is top notch and plentiful. It took us a few meals before we realized we couldn’t eat all the food they offered us, due to the generous portions and multiple courses, even though we very much wanted to devour every bite. 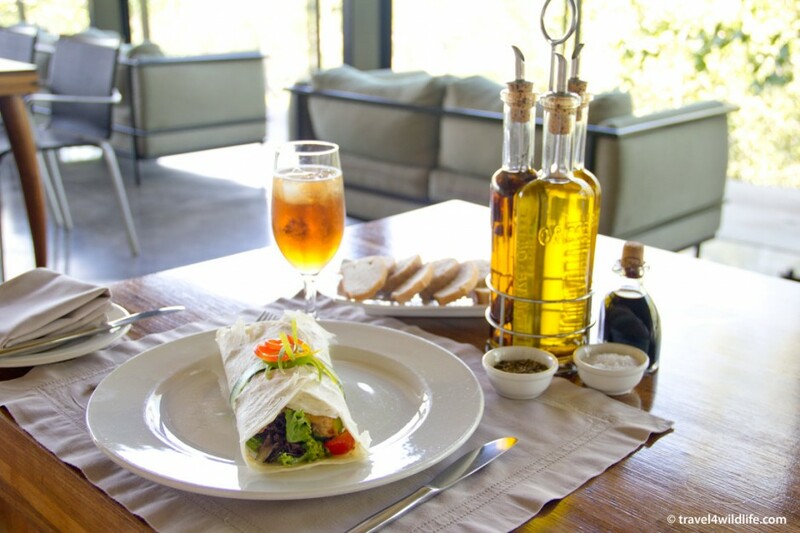 One of the many gourmet meals we were served at the Outpost Lodge. Of course you could just relax at the swimming pool, drool over the view, and eat yourself silly all day, but you’d be missing the main attraction: the wildlife. Every morning and every evening, the guests are taken on a guided game drive around the northern end of Kruger. 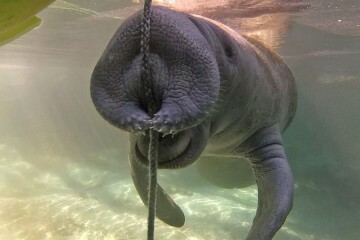 Our guide’s name was Joey, and he clearly enjoyed his job. His enthusiasm for the land and for the wildlife was obvious and, though on occasion he drove maniacally fast, he did deliver us a few great sightings. 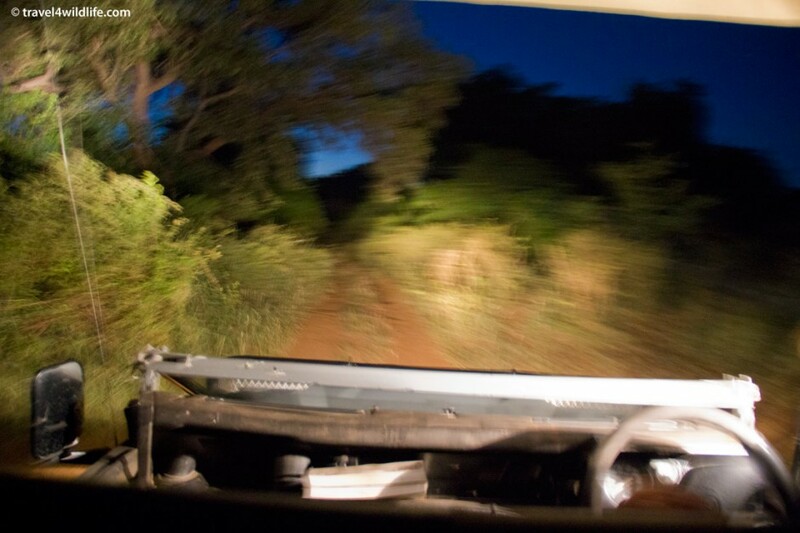 Dashing down a back road in Kruger on a guided night drive. As the sun began to set, Joey arrived in the magical fever-tree forest, stopped his rover, and set up a lovely mini-bar in the wilderness. Snacking on biltong and hors d’oeuvres while sipping an import beer, we watched the baboons cavort in the trees while the sun slowly sank through the army of pale green trunks. This “sundowner” ritual is popular among luxury lodges, and although Cristina and I always chuckle when we see tourists sipping wine over a table cloth out in the bush, I have to admit that I thoroughly enjoyed it. We all were keen to spot a leopard as Joey said that he sees them at least once a week in the area. 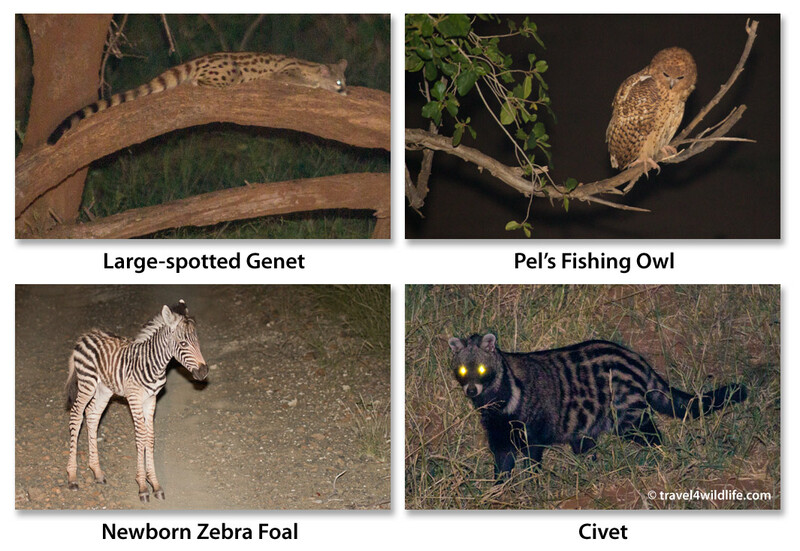 However, we were more than happy to settle for a pair of male lions resting under the full moon, a hunting lioness, a rare Pel’s Fishing Owl watching the river, and my personal favorites: a smattering of small mammals that I rarely get a chance to see including large-spotted genets, a civet, lesser and greater bushbabies, and even several four-toed elephant shrews! Northern Kruger does not generally have the high concentrations of wildlife that are found in the southern end, but with a little more work you can certainly see nearly all of your dream African animals. And if you like to feel a sense of solitude in the wilderness, heading to the top of Kruger may well be worth your trek. 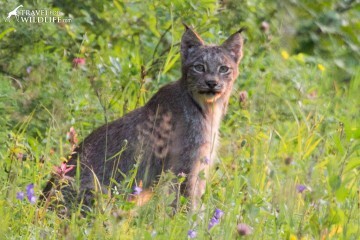 Another wildlife surprise was readily visible right on the Outpost grounds. 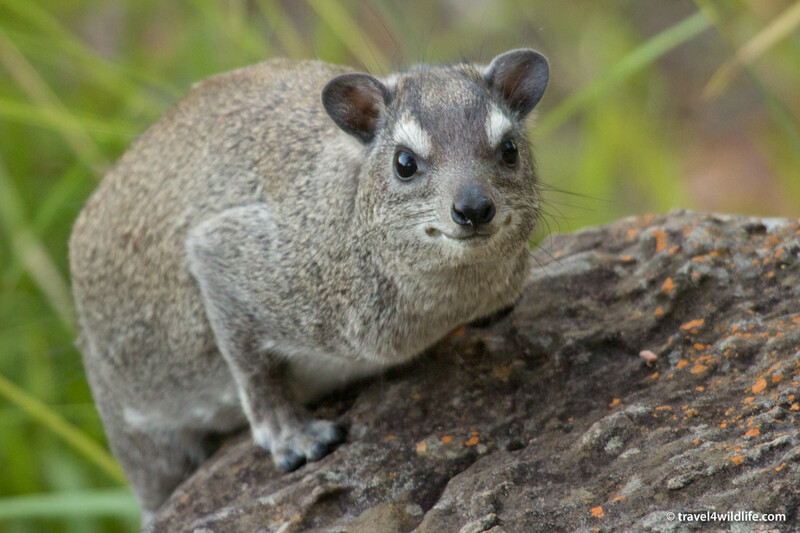 There is a colony of Bush Hyrax living in the trees along the boardwalk and you can see them each day scampering around and sunning on the rocks just meters away. Though I had seen Rock Hyrax in many places around southern Africa, this was my first time ever seeing the Bush Hyrax species, and watching them climb nimbly through the branches was a real treat. Bush Hyrax, right next to our room. A rare treat in South Africa. And our grand finale, as we were driving away from the Outpost, we spotted no less than four different flap-necked chameleons making there way across the driveway. Drive slowly and keep your eyes peeled! 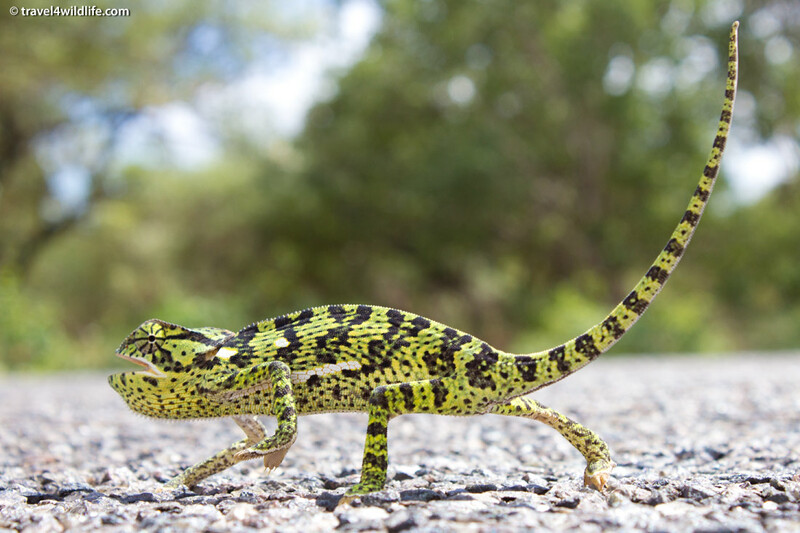 We spotted at least four flap-necked chameleons in the road while driving away from the Outpost. I could totally get used to this. It was a real treat after a week of camping! Where do I sign up! Talk about dream trip!